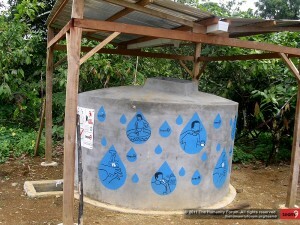 A Water Tank that Communicates. W3-O Design Lab is no stranger to The Humanity Forum (THF) and Team9, having been a loyal supporter of both for several years and counting. The reason simply being that Team9-THF carefully analyses who and what they support, before deciding to take on the project. More importantly, they get things done effectively and efficiently. 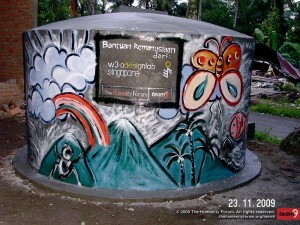 So, what got us started on this new quest with Team9-THF, was the inspiration gained from Trauma Healing Programme in Pariaman, after the 2009 Padang-Pariaman Earthquake where both teams painted some illustrations on the Tangki Ferro Cement (TFC – which means Ferrocement Water Tank in English), as a form of art therapy for post-trauma syndrome. 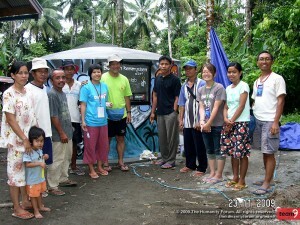 From a designer’s and media specialist’s perspective, we saw an opportunity to create something more than just a water tank – a communication platform – for their Mentawai Rebuilding Campaign. 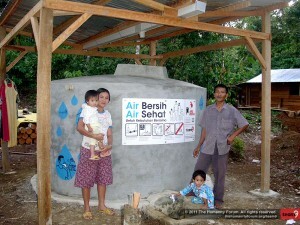 We proposed the idea to Team9-THF, and they were delighted with it as this would help in the extension of their hygiene programme for the Internally Displaced Persons (IDPs), who lacked public and hygiene utilities in Mentawai. As the Mentawai people collect water for their daily usage from the river, they wouldn’t know or understand the purpose of having a water tank or clean water for that matter. So, we needed to formulate a message that conveys the purpose and proper maintenance of the water tank. 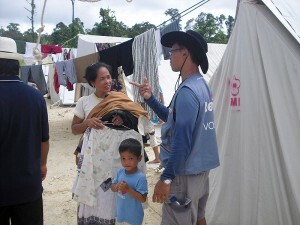 However, high-level of illiteracy in Mentawai was a challenge to us as we had to convey the right message to them. 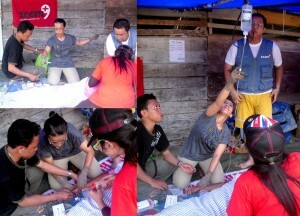 On top of that, we needed to allocate some space for the donor and Team9’s logo, and ID number for tracking. With all these in mind, we concluded to execute our message using iconography with simple vector illustration. Cegah nyamuk Malaria. 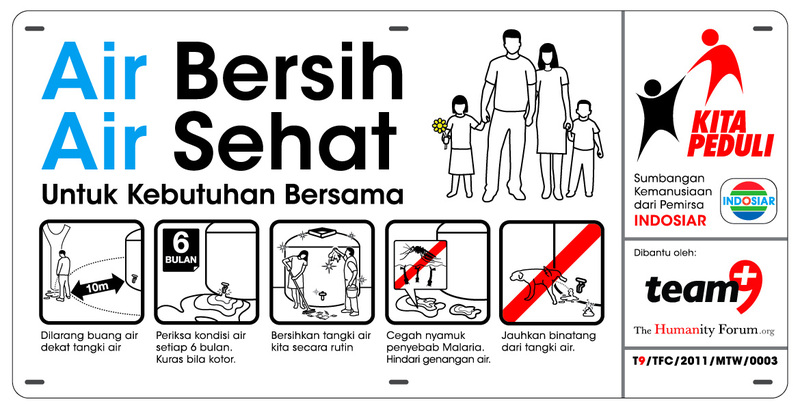 Hindari genangan air = Prevent Malaria Mosquitos. Avoid water puddles. Sumbangan kemanusiaan dari permirsa INDOSIAR = Humanitarian donation from the viewers of Indosiar TV channel. 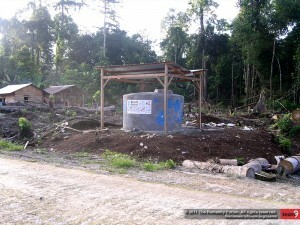 Since Mentawai people are not well-versed in their hygiene practices, we decided to extend Team9’s hygiene programme by educating the locals on the usage and maintenance of these water tanks. 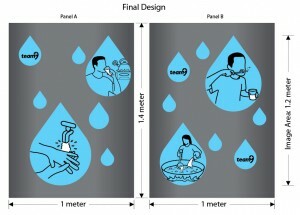 So instead of listing down a step-by-step guide of how-tos, our design expertise led us to create iconography of different scenarios where locals can use the clean water for their daily lives – from bathing to cooking and drinking. Is that all? Certainly not! If you think all the above mentioned were mind bogglingly tough, the best challenge had yet to come! Sparking off ideas like fireworks is easy, but carrying it out is where the hair-pulling and table-banging starts. Besides executing, W3-O also had to mull over the production of our materials. We definitely could not produce the artwork in Singapore and transport it over to Mentawai, due to cost limitations and accessibility. Also, producing the artwork in Mentawai is a no-go as they lack electricity and printing equipment. But with W3-O’s expertise in maximising cost efficiency and know-how, we proposed to print weatherproof metal plates and create stencils in Jakarta, before the team sets off, and paint the illustrations in Mentawai. Additionally, we’re quite fortunate to have a partner in Jakarta (another supporter of Team9) Matari Advertising, one of the biggest advertising agencies in Indonesia, to lend their support in production. From here, we came up with a simple cost efficient solution together – two heads are always better than one. As the printable area of the water tank is about 7m x 1.6m and there is no “rigging” solution in the middle of Mentawai jungle, we decided to slice up the illustrations into 2 main pieces. This would save Team9 the hassle of finding additional workers just for this job. Design is not just about creating a pretty picture, it’s about improving lives. “Form follows Function” is the key to bridge the gap between aesthetics and benefits. If the end product only looks nice but does not bring about any user benefits, it will get mooted out eventually. Just imagine an obscurely designed chair that is only for the eyes to see, but not for the body to experience. With this, W3-O went all the way back to the fundamentals, which is to fully understand our audience and the environment where our designs are to be placed. After executing the iconography and simple illustrations, we needed to create stencil lines to be cut out. It may seem like an easy task to simply draw lines on the visual, but it’s definitely more than meets the eye. We drew the lines such that it looks like part of the design, without distorting the visuals, turning technical challenges into an aesthetic appeal. 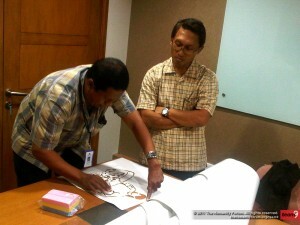 So, by creating an aesthetically enticing visual with an end in mind to understand the whole communication objective and medium, we will be able to stretch design beyond its capabilities – improving the lives of Mentawai people to stay healthy and curb the spread of intestinal diseases among kids. All in all, W3-O is proud to lend our creative expertise and resources to Team9-THF in their 3-year plan of Rebuilding Mentawai. May the Force be with Team9-THF and the people of Mentawai. THF would like to thank W3-O Design Lab Singapore for their continuous support towards our missions of rebuilding life with dignity.